1. Using a mandoline or knife, shred cabbage or kale 1⁄2" thick. 2. Brush or rub both sides of salmon filets with olive oil and season with salt and pepper. Sear filets in a large skillet or grill pan over high heat, until evenly browned, about 2 minutes per side. Transfer to a plate and set aside. Wipe out pan with paper towels. 3. In the same pan, cook bacon over medium heat until crisp, about 10 minutes. Remove bacon, leaving fat in the pan. Drain bacon on paper towels and set aside. Add cabbage and/or kale to the bacon fat and cook 5 minutes. Add wine, vinegar, stock, and cream. Cover and cook until cabbage is wilted, about 15 minutes. 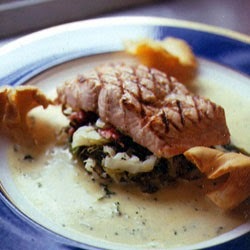 Reduce heat to low and place salmon filets in pan over wilted cabbage and/or kale. Cover tightly and cook until salmon is firm to the touch, about 10 minutes. 4. To serve, spoon cabbage/kale onto plates and sprinkle with the crisp bacon. Top cabbage with salmon filets and a spoonful of pan juices. Garnish with dill and chives.